I used frozen carrots because that’s what I had in the house in case you’re wondering why they have a funny frosty look to them and magical ridges that aren’t found in nature. 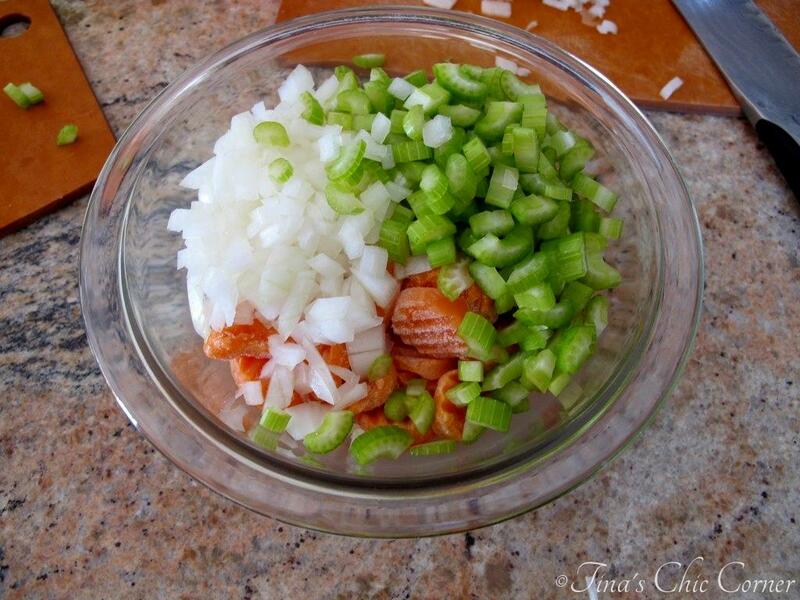 Cooking tip: Chop an onion and store it in the freezer. I don’t know about you, but I hate to chop onions. To save time (and tears), I chop onions that I’ve just bought from the store and freeze them in a freezer friendly bag. Once thawed, they taste just as fresh as the day I bought them. Onions are a popular ingredient in soups and with soup season in full swing I’ll have them handy at a moment’s notice. I used white and red kidney beans and ditalini pasta. I love ditalini because the short little tubes are the perfect shape for a soup. One of the reasons why I love this dish is that you can swap these main ingredients for the type of beans and pasta that you have handy and the soup will still turn out delicious. Remember that we’re going for a no-fuss night! The soup looks a little thin once all the ingredients are in the pot, but it will thicken up as it cooks. 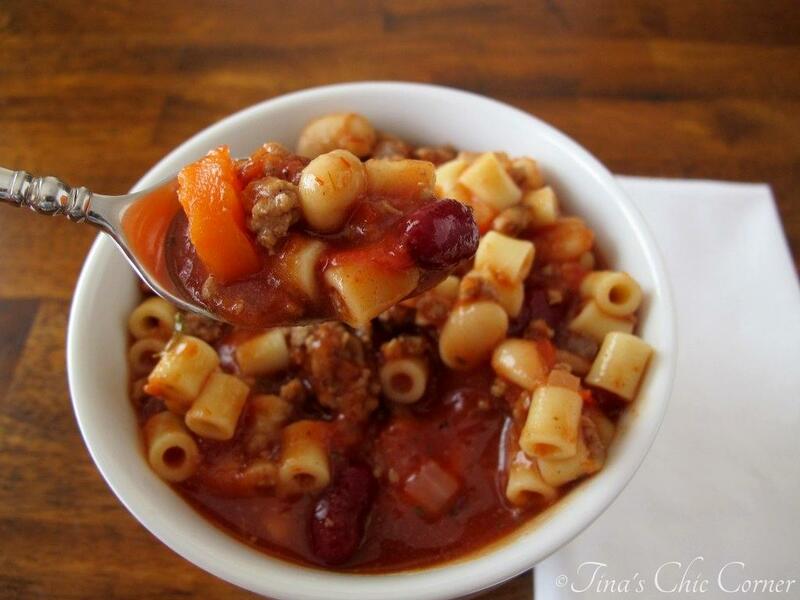 This thick soup has so many textures going on, with the ground beef, veggies, beans, and pasta. In fact, I didn’t add any garnish to the soup because it just doesn’t need it. The seasoning is spot on. 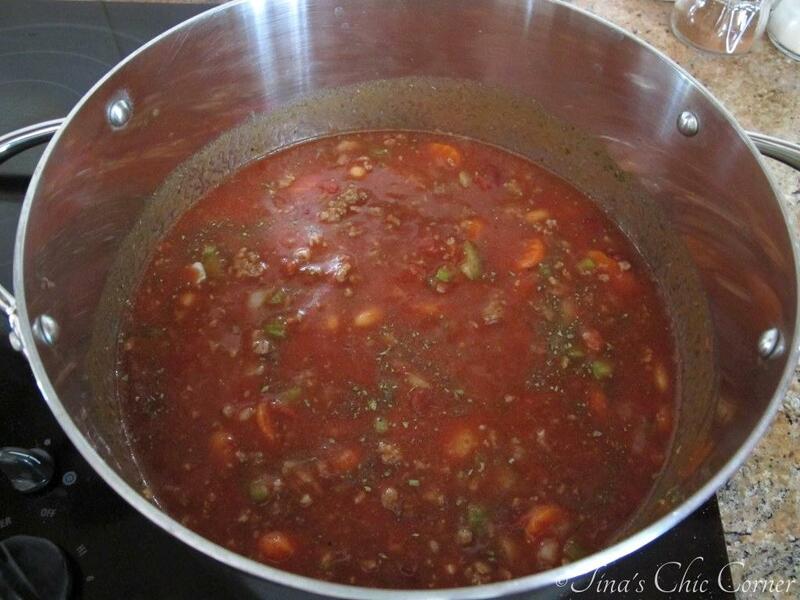 Together with the canned tomatoes and beef stock, this soup is rich and full of fantastic flavors. You know what else is great about this soup? It’s a low budget wonder! 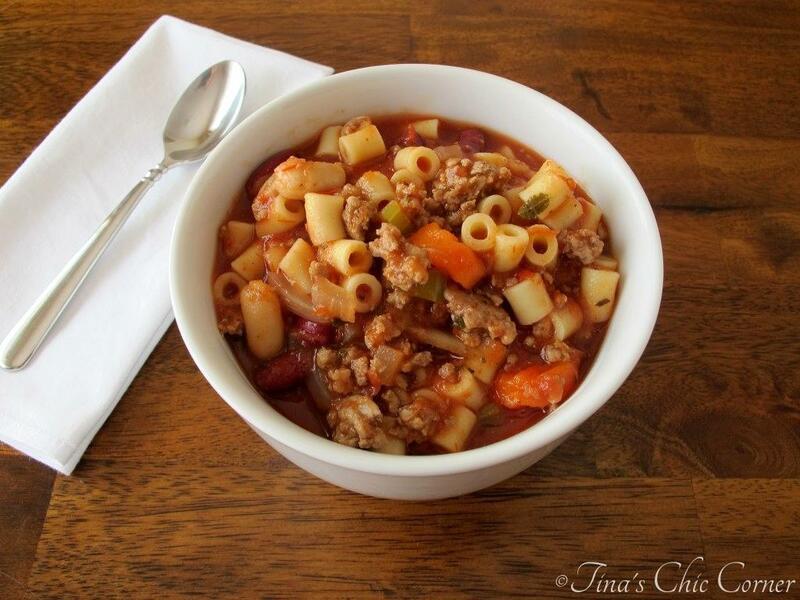 There are many lovely variations of pasta fagioli. If you have a version, how does it differ from this one? I love bread with my soup, like this Beer Bread. 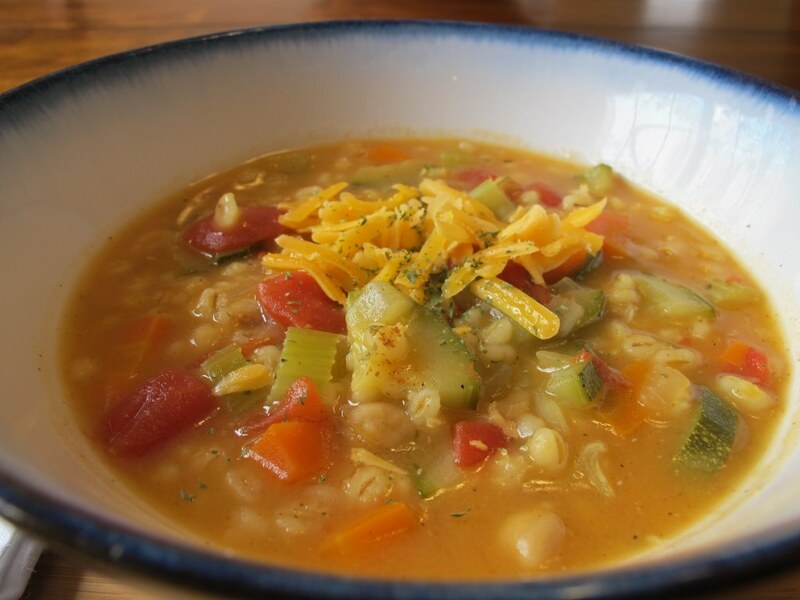 Here are some other fantastic soup recipes. Can I ask as this looks delish. No-one in our home likes kidney beans at all. Would we need to substitute the with something else or would we be ok to leave them out? Would we need to add any extra liquid? I was thinking the same thing – I hate kidney beans! I guess when I make it, I am going to try just adding another can of the white beans. I love this soup! I asked an employee of Olive Garden what makes this soup so special? She said that they put Tabasco in it. It does give it a little kick-just 2 or 3 drops! Also, you can use a jar of spaghetti or marinara sauce for a good base. So delicious, thank you for sharing! 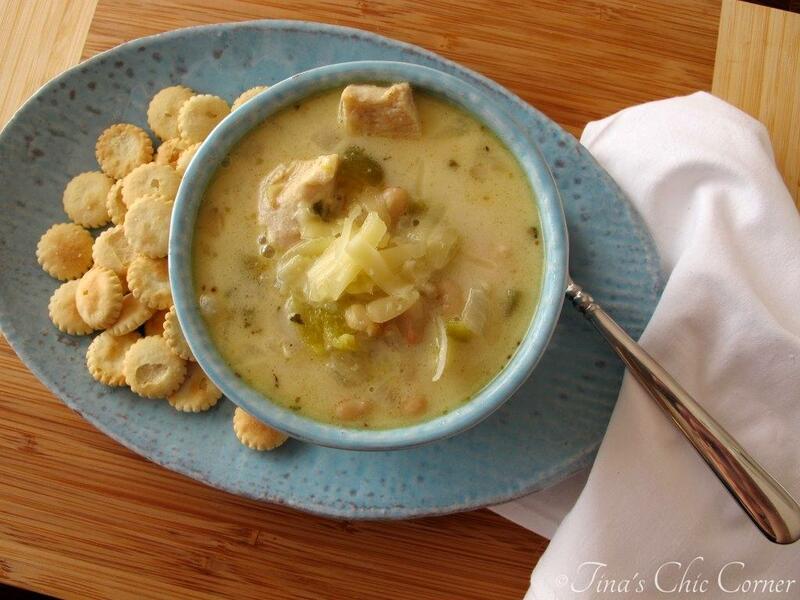 My family including the picky eater all loved this recipe. It was easy to make too. We added grilled cheese sandwiches to make it a hardy complete family meal. I added a small dash of Cayenne pepper to give it a little bite. In addition to a cup of frozen corn, just to add more color. It turned out delicious! We also had grilled cheese sandwiches with our fagioli soup on this rainy, cold day. 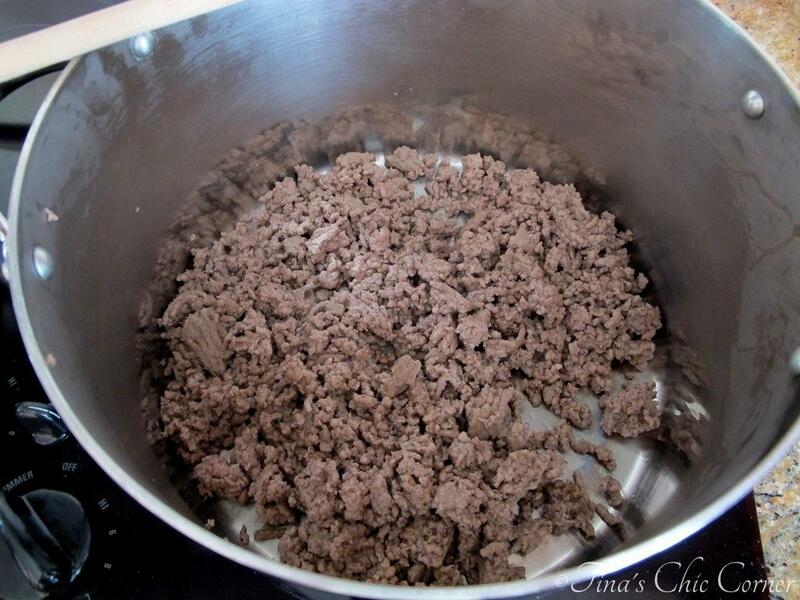 Thank you for sharing this easy, go to recipe. I was looking for something different to make for Sunday night dinner and I came across this on Pinterest. It’s really delicious! I made a few substitutions – I used 1 lb. ground bison and 15 oz. of chicken stock instead of broth because I had a carton open in my fridge. I sweated the veggies first in a Tbsp of olive oil, added the garlic, sauteed for 1 minute and then added the meat. I used Great Northern beans rather than cannellini and dark red kidney beans. For those that don’t like kidney beans, small red or pink beans (in the Goya section) would be a good substitution. My BF loved it and so did I! Really hearty and healthy. This makes a lot of food! I’ll be freezing the leftovers for one of those nights when we’re home late from work and need something fast. This is definitely a keeper!! This soup was sooo good. I browned the beef and put into crock pot with everything else on your recipe, made ditalini pasta separate to add later. OMG thanks! Just like Olive Garden….Genius! This recipe is delicious!!! I used red kidney beans and black beans. I only had 1 can of tomato sauce so I used a can of diced tomatoes. Making this right now smells amazing!!!! Take good to and it just started cooking. Has anyone used a different type of pasta? I don’t have this kind on hand. Was hoping to make it tonight for dinner! I had to use rotini. Not the same at all, but the soup was still delicious down to the last drop! I’m glad you still enjoyed it. 🙂 Thanks for stopping by! I used 1lb ground turkey and 1/2lb sweet Italian sausage. It is amazing. Made this last night as-is for my under-the-weather boyfriend. Used small reds and white navy beans, small shell pasta, and omitted the thyme since it’s not something I use often. Delicious! Although I’ll probably follow the advice of sweating the veggies before, as mine were still a bit crunchy. It was super thick, as well. So we’ll definitely add more stock next time. Loved it either way. Thanks! Jessica, I’m glad you still liked it, with your changes. I appreciate you stopping by! Jessica, Tina deserves all the credit, she has some great recipes. Hope it made boyfriend feel better. My Italian grandma never made it with meat either. Thanks for stopping by! My mom flavored the broth with a smoked ham hock and she started off with dry navy beans. She always used what she had on hand. 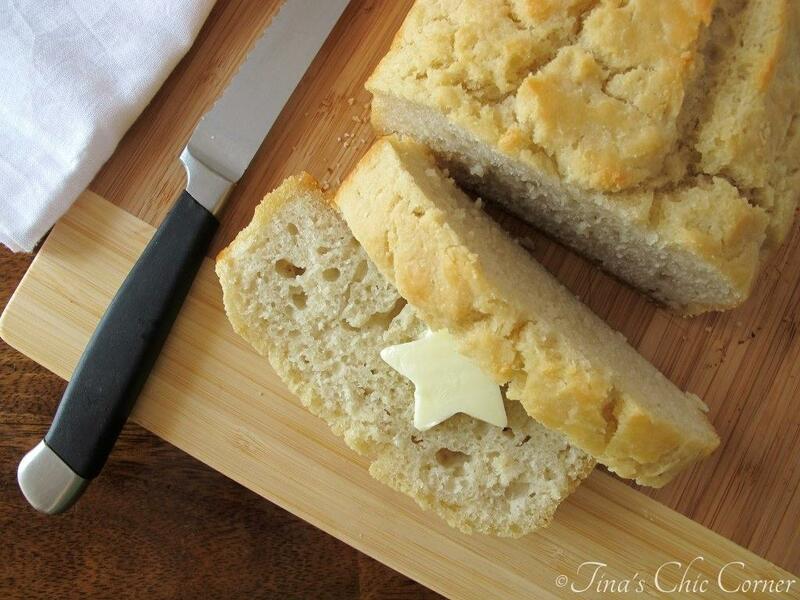 this recipe reminds me of a dish I had when I was a little girl. We called it goulash, and then when I started cooking it, we called it ‘Yankee Doddle Stew’ because my parents were from Independence Iowa. It’s cooking on the stove right now. I used Turkey meat instead of the hamburger and didn’t have the white kidneys, so I used navy. You really can’t go wrong with this dish. I wouldn’t advise adding anything weird like sardines or something like it. I made this last night and let me just say…it was delicious!!! My husband who is not a soup fan LOVED it and had two bowls. Thank you so much for share. I didn’t add the red kidney beans but followed the recipe and it was amazing! I have not tried this recipe in a slow cooker. I have made this pasta fagoili soup twice in the last month. It has come out perfectly delicious both times. You couldn’t find a better pasta fagoili in an Italian restaurant as good as this. Sprinkle some grated parmesan on top and you’re in italian soup heaven. 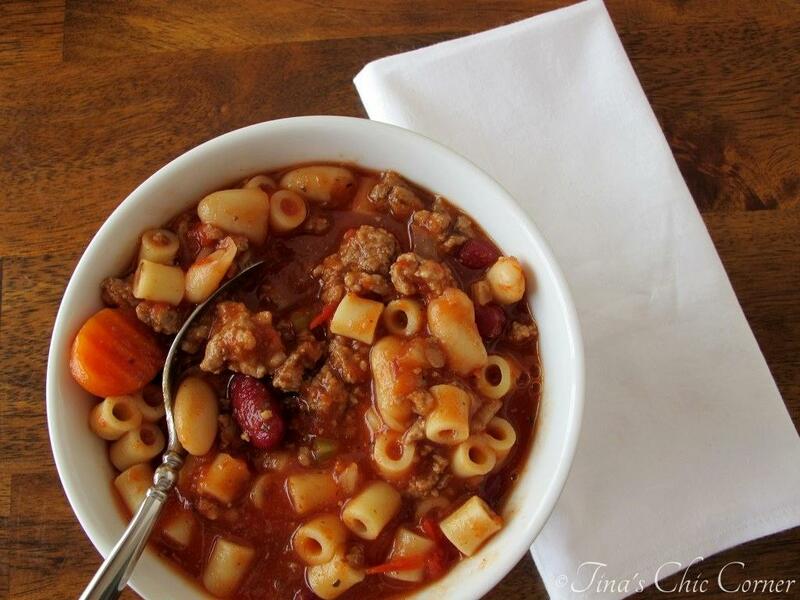 I’ve made this soup many times…it’s one of my family’s favorites. It’s a hearty comfort soup. Mary, you’ve made my day! Thank you so much for letting me. 🙂 I hope you and your family have a lovely holiday season! I followed your recipe exactly as its written. However, I had to use mini bow ties due to my small town grocery not having the ditalini. It still turned out amazing! Best thing; it only cost me $13.00 to make and there is so much of it I have enough for another night. Thank you for sharing this wonderful recipe. My husband doesn’t like chunks of tomatoes so I have to blend them to a purée. I know, just isn’t the same. The soup was soupier, but I love soup so I didn’t care, and he said this was the best soup I had ever made! Wow! A keeper recipe! Thanks! Hmm, maybe try to cut the veggies into small pieces. Let me know if that works. Very good, I would like a little more broth, any suggestions? I think you can add additional beef broth, than what the recipe calls for, to whatever is your liking. Ditalini absorbs a lot of the broth. Next time I will add fully cooked pasta to individual bowls, when serving. Excellent flavor. Made this today. It was very good! I will definitely make this recipe again. Topped it with a little freshly grated Parmesan. Yummy! Wonderful! Added a poblano with the veggies and finished with a little pecorino on top. Thanks for an easy, delicious recipe. Just made this amazing recipe for the first time and it’s delicious!! Super easy to made and we definitely have leftovers for a couple days. Thank you for sharing your recipe. Absolutely delicious. Since it makes more than my hubby and I can eat, I used elbow macaroni, put it separate into bowls, and spooned the soup over. That way I can save the soup without pasta because I was afraid the pasta would get soggy. Thank you so much for this recipe! Even my picky husband liked it. Just wondering if this soup can be frozen for later? I’ll have a lot of leftovers. 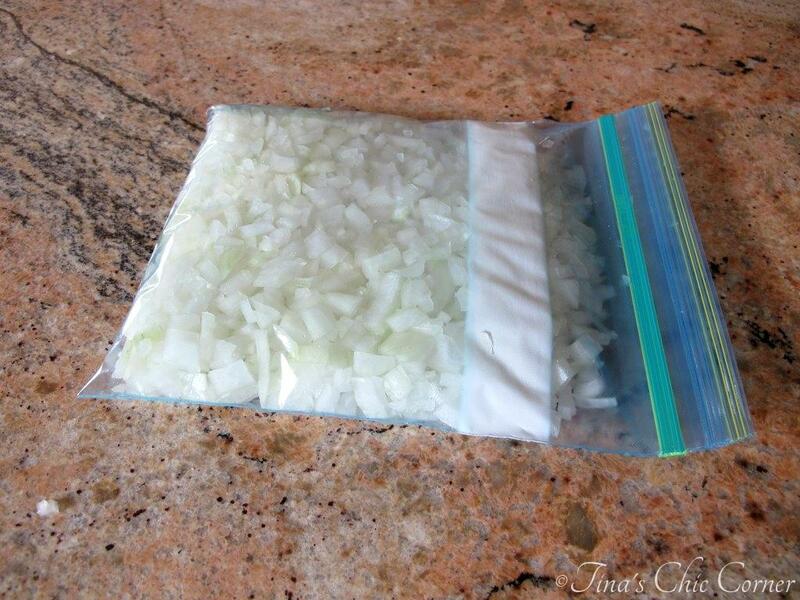 Absolutely you can freeze leftovers. I’ve done it many times & I think it reheats well. However I will also say that a few readers have told me that it’s better to freeze it without the pasta. It’s about preference of course. I don’t see why not, however, I have never tried this recipe in a crockpot so unfortunately I cannot suggest timing and temperature. If you try it in the crockpot, let me know how you make out! This is my second time of making this soup we love it. I️ used chili beans and navy beans in it this time. Yummy with a slice or two of chewy artisan garlic bread warmed up, gonna eat good tonight❄️? Janet, I’m so glad you love this soup! 🙂 Thanks so much for stopping by! I’m trying this today. As is. I am always a bit amused by people who say they love a recipe and then describe how they changed by adding this and that, or omitting something, the very first time they make it. It’s no longer the recipe! ? Joyce, your version sounds delicious! This was wonderful! I added corn and more pasta. We will definitely make again! Oh the corn sounds like a delightful addition! Thank you so much for stopping by! I am the cook in the family and just had knee surgery a day ago. When I came across this recipe on pinterest I also book marked it on my computer thinking this would be a easy recipe for my husband to make. I chopped the veggies for him and gave moral support as he went through the process. He didn’t understand why he couldn’t just to pick up something or make (boxed/processed) mac n cheese. (My stomach is still saying no just typing it.) It turned out delicious even with the minor changes we made. Hopefully this will boost his confidence so he will want to help in the kitchen even after I recuperate. Thank you for the recipe and the easy layout. Cheers! I made this soup yesterday. 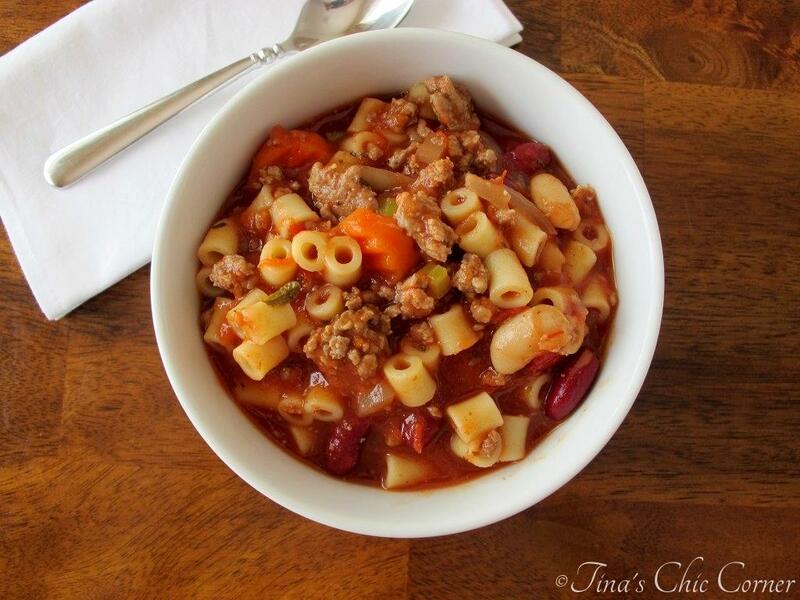 While the flavor was there, it wasn’t a soup – it was way too thick and got even thicker when I added the pasta. Should have added more beef broth or no pasta at all. Probably will not make it again.